This is a fantastic gift for the Grand Parents as well as the rest of the family. 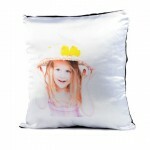 Share your love with your girlfriend and send her a couples cushion. Want to something different for your wedding, have one made especially for the all important wedding rings to be placed on.